McDonald Green would like to present you with your next quality candidates! Highly organized administrative professional with diverse experience in the engineering consulting field. Motivated professional that enjoys working and prioritizing tight deadlines. Janet is working towards her paralegal license and posses work experience as a paralegal assistant. Utilizes Korean bilingual skills as an interpreter during trails and meetings at the Ontario Court of Justice. Experience as an IT service Desk Supervisor who leads teams and facilitates training sessions and workshops for a large global engineering firm. Guided team to exceed target of 80% incident resolution/ completion as established by corporate service level objective. Strong leadership and mentorship skills that can be applied to various industries. A statistics major, economics minor, CFA program enrolled candidate with a math degree. Strong analytical skills, likes being part of a revenue generating team, he finds it rewarding to find new business, business development. Strong, proven negotiation, sales and formal proposal skills. Strong understanding of driver regulations which allows him to be successful in making quick changes and/or accommodations. Has experience with handling and transportation of hazardous materials and dangerous goods. Has dealt with the logistics and dispatch of drivers, understands the fast-paced environment and the strong commitment to accuracy. 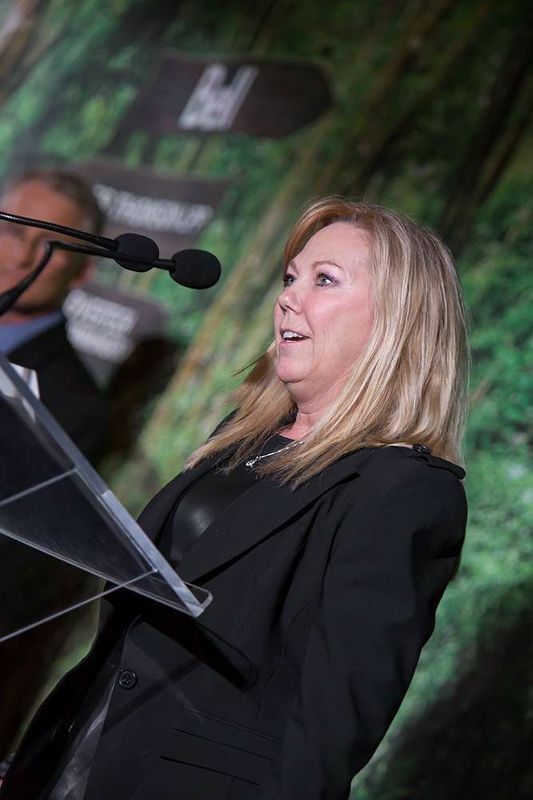 “Toni has been an integral part of the continuous growth and diversification of McDonald-Green since 1999. It is with great pride and appreciation that I announce Toni has accepted the position of Vice President, McDonald-Green. When Toni joined McDonald-Green so many years ago I had a good idea of breadth, depth and scope of contribution she would make. What I didn’t realize is how much she would resonate with the culture of our organization. Toni has an amazing ability to seize opportunities that we are afforded but also able to provide new and innovative ones. Toni has worked with McDonald-Green for the past 15 years. 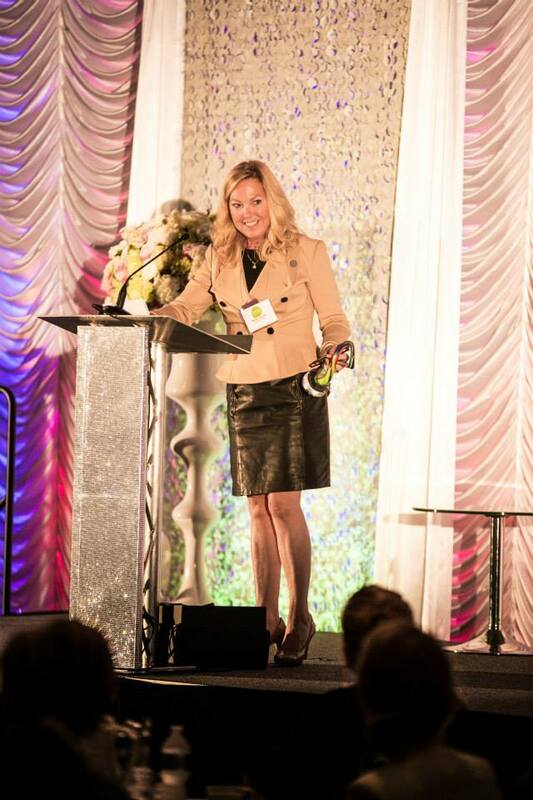 She takes the lead on Corporate Training, Sales and Consulting Services. Toni has a solid foundation of leadership and she shares that knowledge with MG employees and clients. She is a registered training professional, certified by the Canadian Professional Trainers Association. 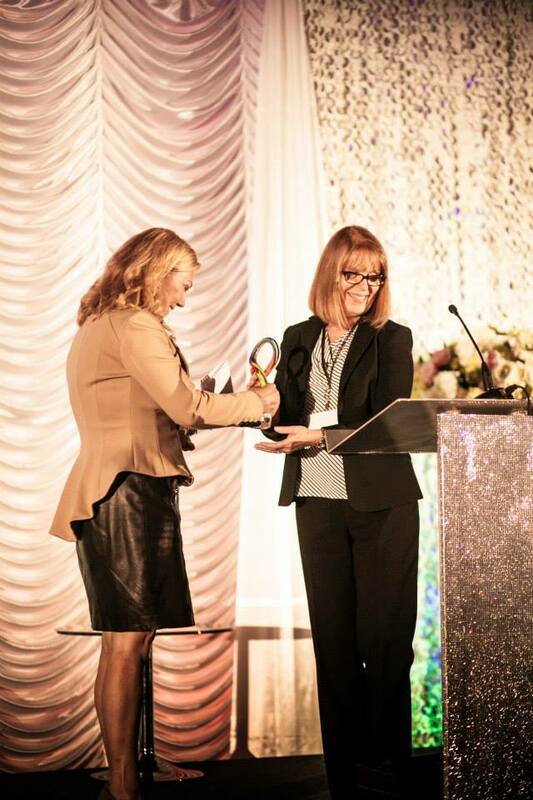 She also holds a Certified Sales Professional (CSP) designation. 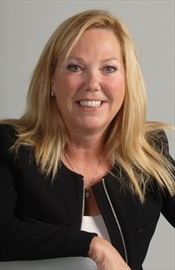 Toni currently volunteers with KWOktoberfest and has sat on the executive Board of Directors for the Business & Education Partnership of Waterloo Region. 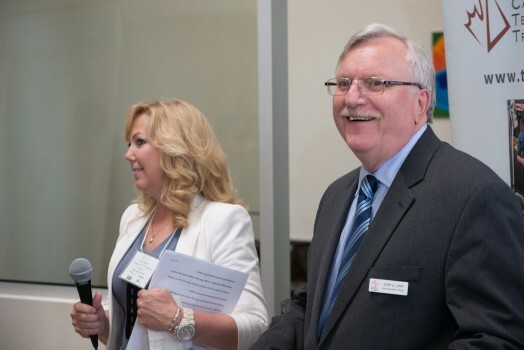 She has also sat on the Board of Directors for the local chapter of the Canadian Society of Training and Development. McDonald Green is the largest, locally owned Human Resource Consulting firm in the Tri City Area, providing outsourced HR services, including but not limited to HR Consulting, Training & Development, Executive Search, Assessment Services, Career Transitioning and Outplacement. 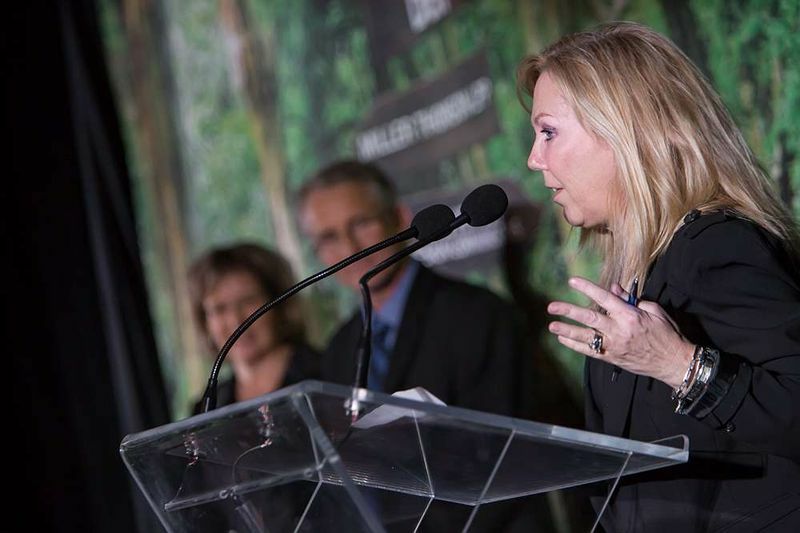 A great deal of McDonald Green’s success is due to strategic alliances with their customers; not just performing the recruiting function, but building a cohesive, highly productive team for the customer, resulting in a heightened return on investment. The Greater Kitchener Waterloo Chamber of Commerce event was held at Bingemans and featured five speakers, including fashion journalist Jeanne Beker; president of Sleep Country Canada, Christine Magee; chief executive officer of Linamar, Linda Hasenfratz; paralympian medallist, Summer Mortimer; and entrepreneur Jessica Jensen. 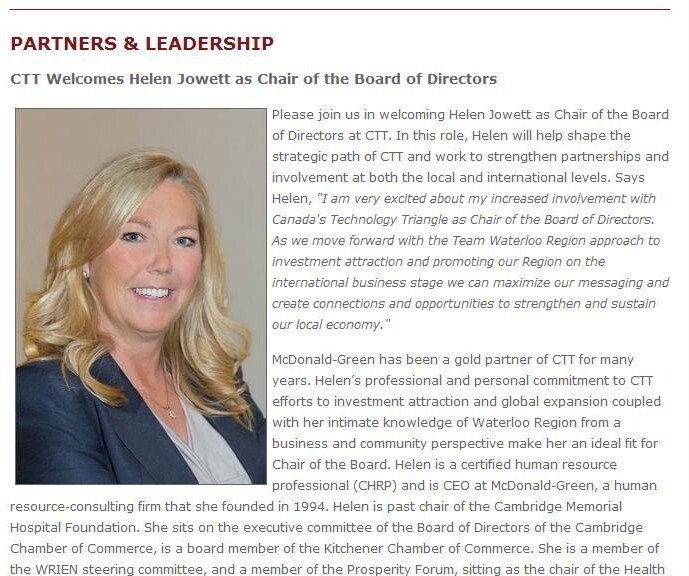 Modest to the core, Jowett said it was a young neighbour who nominated her after researching Jowett’s impressive background as a human resource professional and president and chief executive officer of her own consulting firm, McDonald Green in Cambridge. Click Here for the full story on the Record website. 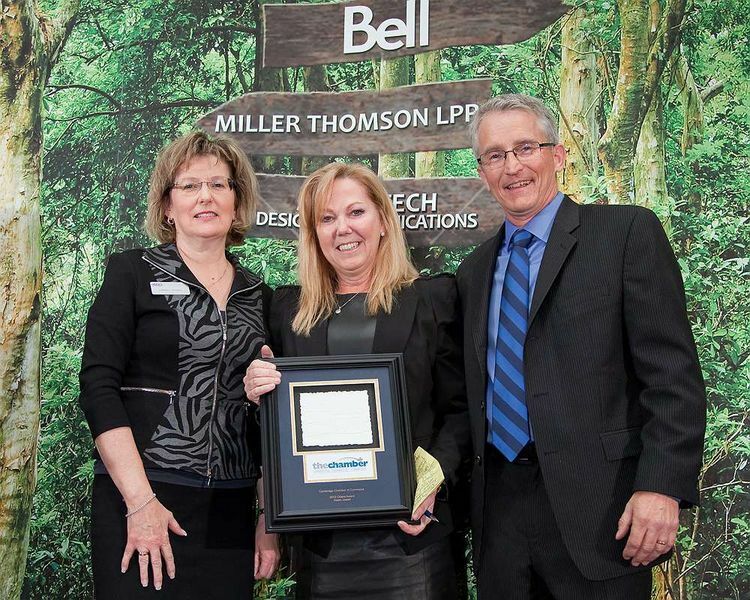 Canada’s Technology Triangle proudly displays sponsor appreciation with a wall of plaques for their partners – including McDonald Green! 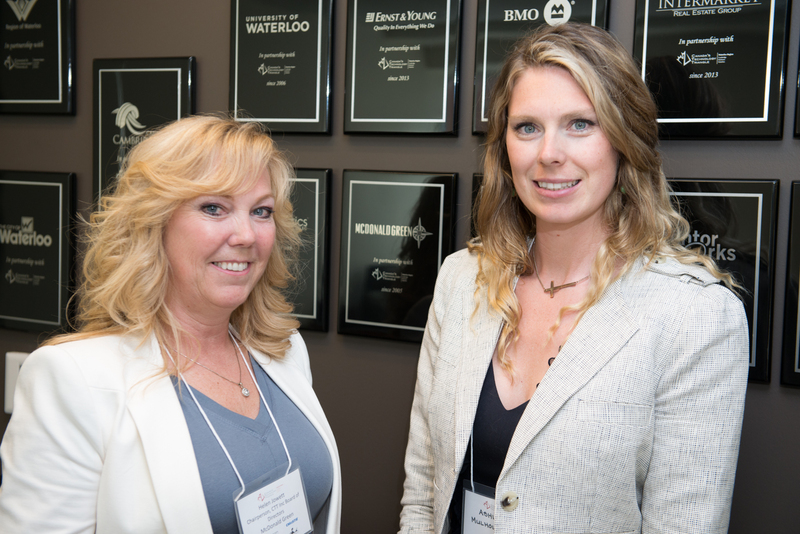 Ashlee Mulholland and Helen Jowett of McDonald Green, CTT Partners at the CTT open house in Kitchener Thursday May 9, 2013. Helen, current Chair of CTT, pictured with CTT CEO John Jung, saying thank you to sponsers , partners and community supporters alike. Congratulations to our Fearless Leader Helen Jowett. 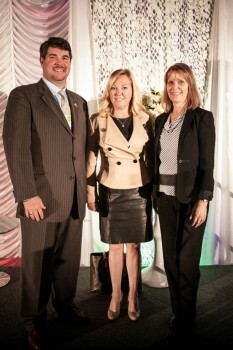 She received the 2012 Chairs Award at the Cambridge Chamber of Commerce Business Excellence Awards. Her success is partly attributed to a deep sense of Entrepreuership, stemming from her “first paper route as a child”. 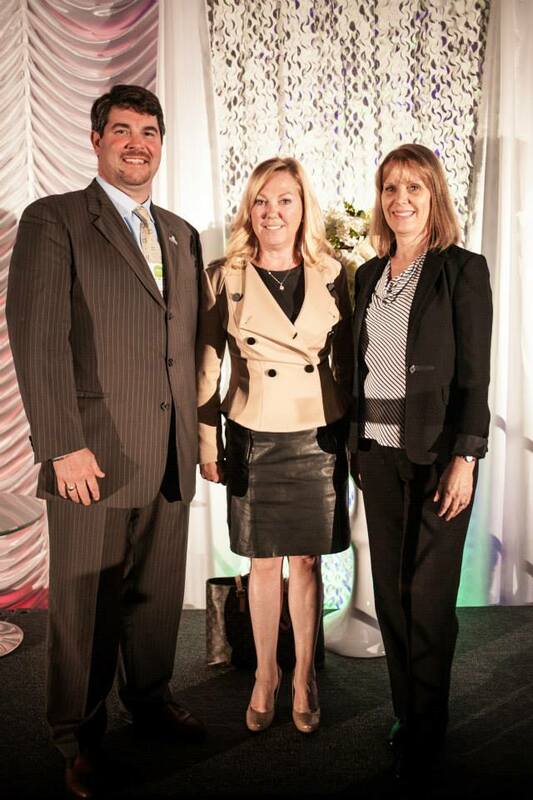 Helen Jowett President and CEO of McDonald Green Human Resources – Chair of Canada’s Technology Triangle. Helen Jowett of McDonald Green Human Resources Consulting speaks on behalf of CTT, Cananda’s Technology Triangle with regards to our regions business climate. Helen Jowett speaks about managing teams for the TiE Institute TO.